In short: Our kid is a budding perfectionist. This worries me, because I know very well the pain and suffering that comes from expecting perfection from yourself. On Thursday evening, while Benji spent the night at my parents’ house, Ian and I spent some time talking about our strategy for what to say or do when these episodes arise. I hope we can help Benji learn to accept his imperfections before he spends an entire school career, let alone the rest of his life, seeking after an impossible standard. So you know how people use the word “ironic” wrong constantly? Well, I’ve got a case of real irony for y’all. On work nights when Benji does a sleepover somewhere else, I usually get up at my normal time and catch a very early bus. Think 5:50 am. I get to work about 6:20 am, a commute about 50% faster than when I catch the 7:15 bus. I like getting to work that early because it’s quiet (there’s actually one other lady there, who also takes that same bus) and I can get a lot done in the couple hours before the majority of people arrive. That’s what I did Friday morning. Unfortunately, I had some technical slowdowns (you can’t rush those Microsoft updates), but just about the time I was getting ready to actually start doing some work, my boss called my cell phone. It was about 7:00. Long story short, the release notes I wrote that we deployed to production the previous night contained a screenshot that included personally identifying information (PII)–in this case, most of several account numbers, client names, and transaction information. This information appeared in a sample screenshot I’d taken from the technical specifications written by the Project Manager. 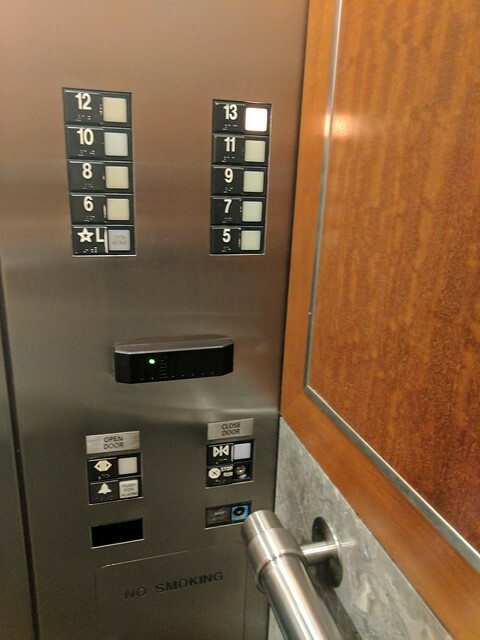 Well, &*&^#*%$#@. That’s what I call a big mistake. In fact, it’s close to the worst thing I, personally, could do in my current job capacity. It came to our attention because the firm whose client data that was saw it and flipped their lid. Understandable. This information went to… well, pretty much everyone in management at the company. The Managing Director of our division was already talking to my boss, who’s the VP of User Education, and my boss was now calling me. Delightful. Now the Managing Director, who presumably didn’t know I existed before today, not only knows I exist but knows I really screwed up bad. My boss had already logged on and deleted the screenshot from the server, so anyone opening the release notes would just see a broken picture icon rather than the image. 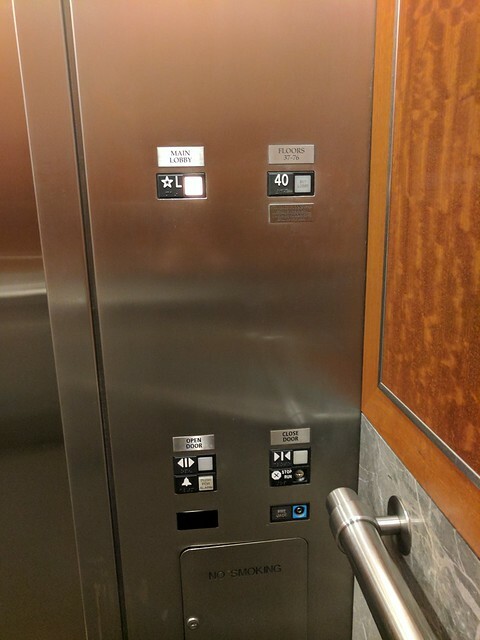 There then followed a very long period of first me, then my senior technical writer coworker, then my boss scrambling around trying to solve some related issues. I won’t get into any more of the details, but I got to really decide: What do I do when I make a mistake? Because that’s exactly what we’ve been wanting to help Benji deal with, and now I get to apply that very stuff in a grownup situation. I went into a little phone booth room and cried. A lot. Because it was only 7:15 am, and nobody else was around. Although, I’ll be honest, I cried again later after my boss talked with me. That wasn’t the funnest experience I’ve had. I tried to be normal the rest of the day, but I wasn’t. It was tough to work. But I did keep reminding myself that it was a mistake, my value doesn’t change because of it. I ate, even though I didn’t feel like it. 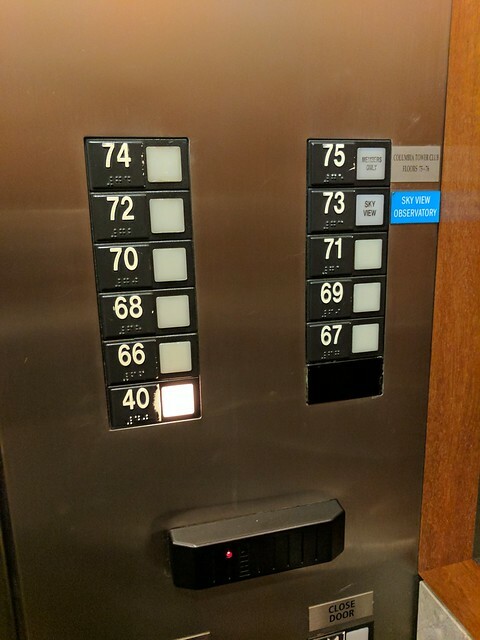 I did what I could to fix the mistake. Which wasn’t much. I will not make that mistake again. I imagine that next week we’ll have a meeting to talk about how we, as a writing team, can change our processes to catch these kinds of mistakes in the future. I went to bed at 7:15 pm. Ultimately, I don’t feel I did a great job with my response. But I’m going to let the guilt, shame, and recriminations go and keep doing my job to the best of my ability. One day I had a joke that I thought was funny, so I wrote it on the white board to share with people walking by. Several people, walking by, read it and chuckled, or at least shook their heads as they walked away. I started writing jokes up on the board every few days, maybe two or three jokes a week. What do you call a bear that’s gotten stuck in the rain? A drizzly bear. OR, alternative answer offered: A drown bear. Why are there no knock knock jokes about America? Because freedom rings. Several people have told me that they bring the jokes home and share them with family members. I know that I inflict these jokes on my biking buddies, eliciting many groans of dismay (but I know it’s happy dismay). At least two people have told me they specifically walk by every day to check the joke board for the next joke. And of course at work I see many people pause, read the joke, and walk away shaking their heads–the ultimate sign of a successful joke. All my jokes are either puns or dad jokes. There’s not enough room to write an elaborate joke; they really have to be one-liners or a question and answer. Thanks to the Internet, I have ample jokes to keep the board going, but I now have more pressure than ever to find good jokes! 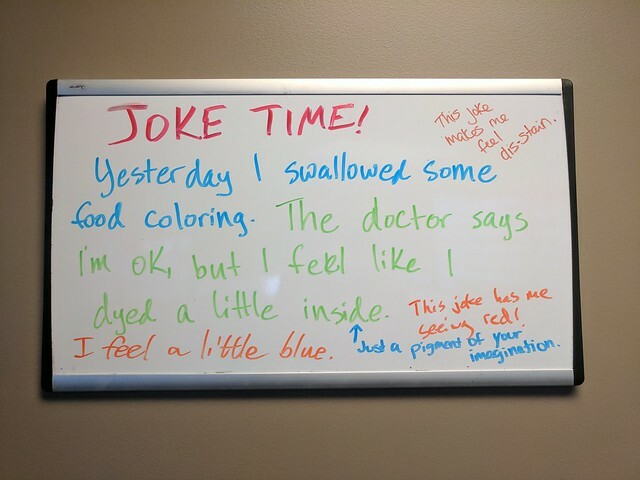 So we were humming along happily for a while, and the joke board was getting its own following. Then, oh no! 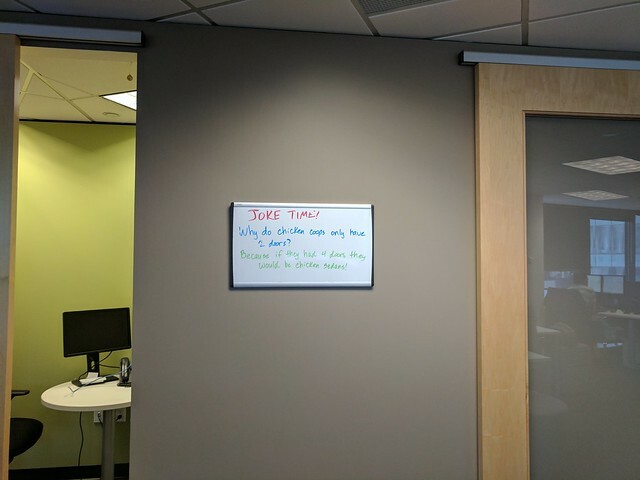 A new guy got hired and chose to sit in the empty spot occupied by the Joke Board. 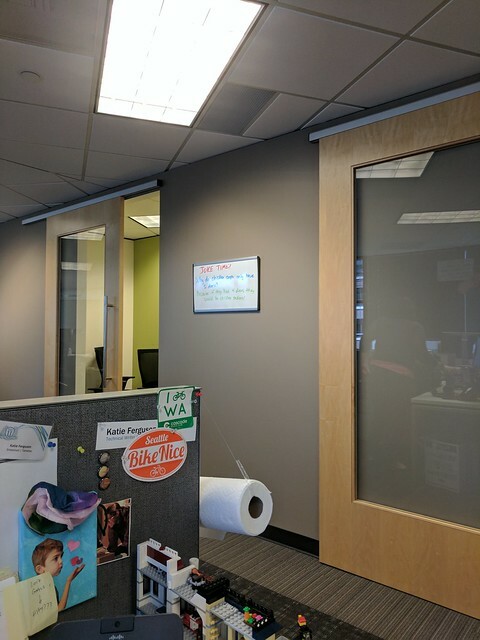 But when God closes a door, He opens a window (or so I’ve heard), so I took the opportunity to have the Joke Board officially hung up on the wall near our area. By the way, getting the board hung up was no joke. 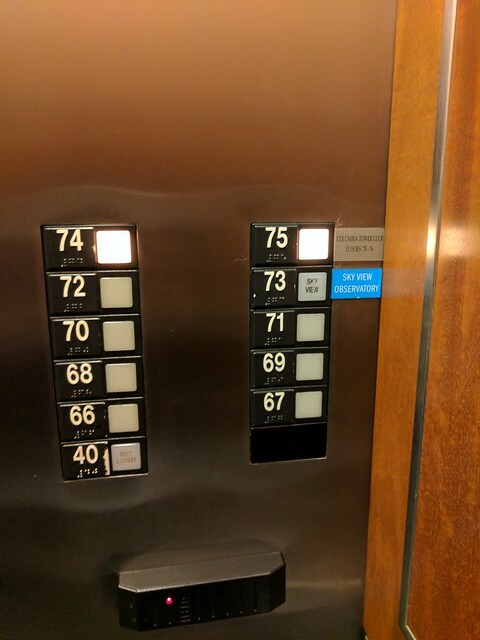 I had to contact our receptionist and I asked him to put in a work order with the building management company. They sent a handyman with his little cart of hooks and screws and a level, and this guy hung it up. Alas, he hung it slightly off-center from where we asked, but oh well, now it’s up and it’s official! 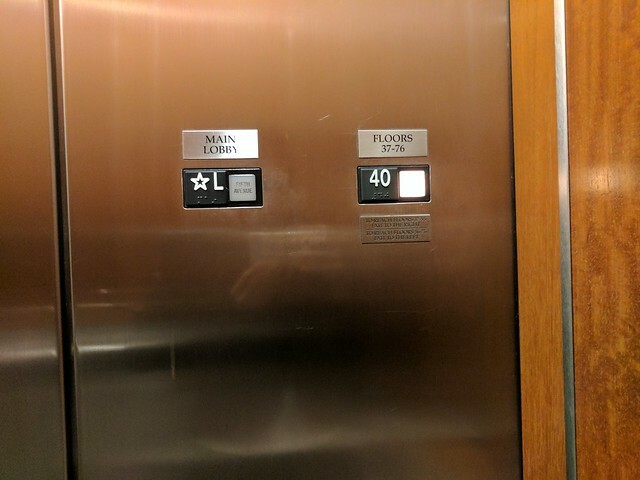 I was out sick for a couple days last week, and when I got back there was a new joke up. One of my team members had written a new one, and they told me that they’d even had another joke up in the interim, which elicited several participatory alternative punchlines. 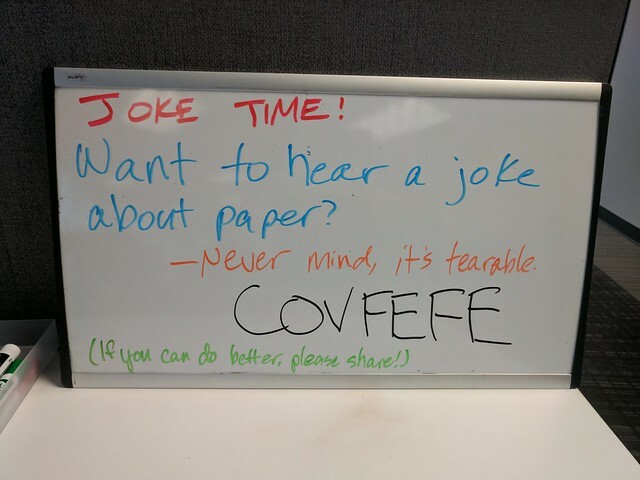 Here’s today’s joke board, which I got so many laughs from–first the pun itself, and then at least half a dozen times watching other people read and react to the pun. It’s truly priceless. 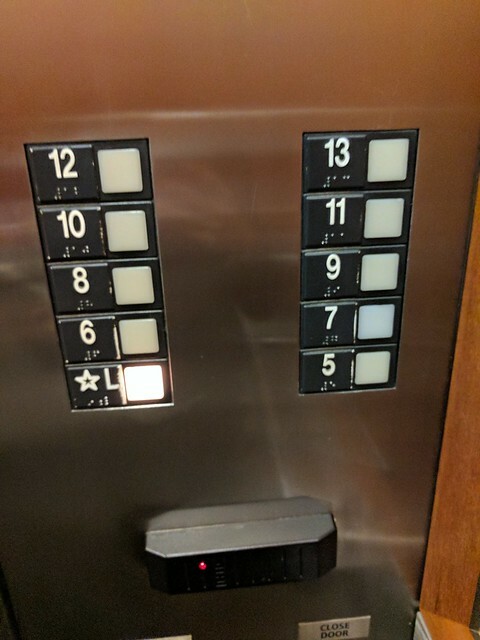 I’m about to do my six-month employee assessment. One of the questions is: “What are some of your accomplishments from the last 6 months?” I’m absolutely putting the joke board in that list. I haven’t mentioned my job recently, and that’s partly because it’s been going pretty swimmingly. I like my team, I like my boss, and I really like my actual duties. It’s as close to the perfect job as I could imagine. The last couple weeks, we had something happen that, at first, shook my trust in the company. I was afraid that it would turn out that my company was less scrupulous than I thought. But, just as I was feeling really disappointed, my boss showed some real integrity and completely redeemed the situation (from my perspective). I was deeply impressed at the way my boss ultimately handled the whole situation. I mention this because it made an impression on me. I talked with my boss about my concerns, and he listened and took action. This may be the first time I have ever had that happen at a job. Having my voice listened to and respected made a huge impact. So, it remains true: I feel like I have landed at my perfect job. I’m thankful every day to have the opportunity to do it. Most of all, I’m deeply grateful that we went out on a limb and decided for me to apply when I saw the job opening last fall. I just looked at the calendar and counted: I’ve been at my job for 7 weeks already. Time flies when you’re having fun, I guess, because it feels like just yesterday we started this crazy adventure. On the other hand, it’s been long enough that we’ve started finding the routine that works for all of us to do what needs doing while staying sane. Benji and I spend his first hour up together, and I make sure to get some of his prep stuff done so Ian doesn’t have to. While we’re hanging, Ian gets ready for his day. I leave the house at 7:15, and get home any time between 6:00 and 6:30, unless I have to stay late. I’m not feeling stressed out yet. Maybe that’s ignorance, and I should start stressing, like when I did my first bike race and I really had no idea what was going on and whether I was safe or not. But I keep checking with my boss and coworker to make sure I’m doing the right things, and so far it seems like I’m on top of everything. The way the job works is the developers make features based on things called User Stories. We, the writers, find out which User Stories will be going out at the next release. We research the stories, reading the technical specs and trying out the features in the test environment, so we have an idea of how the new feature works. Then we meet with the people in charge of each User Story (Project Managers, PMs) and interview them about their User Stories. 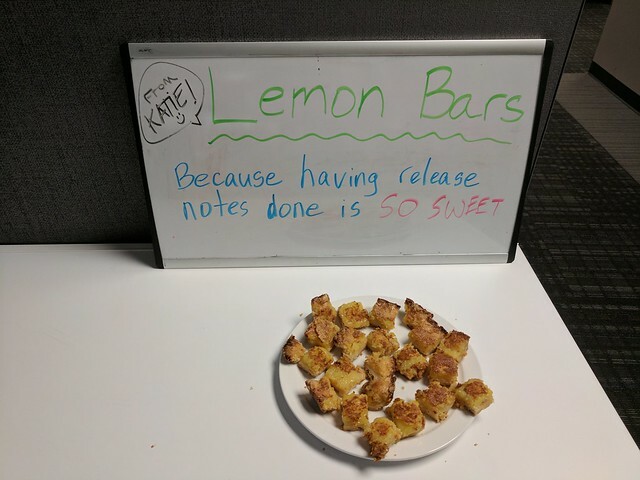 Then we write Release Notes, which describe not only the mechanics of the new feature, but emphasize the “Why,” as my boss puts it. We have to really sell the feature, making it sounding exciting and worthwhile. Release notes are my first deadline. This is a big deal, because it’s the first time my writing goes out to the senior management and all the PMs for review. I have to hand-deliver a hard copy of the release notes to the president of the company for him to read (!). After I get release notes written, I go into the Help Center and edit or add pages to cover details of the new features. I have two weeks to do this from the time the release notes go out to the time the actual release happens. Many features don’t require a ton of new writing, but rather expanding or modifying existing content. Unfortunately a lot of changes to the look require new screenshots, which are difficult to find and take some time to replace. But some of the changes will require me to write entirely new pages, and that takes time, too. As I mentioned, I’m not feeling stressed. So far I’ve certainly felt time pressure, and the need to focus and work diligently. As far as I can tell, I’ve not yet fallen behind, and if anything I’m a little ahead of where I need to be. Unfortunately, I do have an entirely separate, unrelated project that’s quite big and going to take a substantial amount of time, and that’s going to come due right around the end of April, too. Time to engage in some serious time management. I’m not sure how much blog writing I’ll do as we approach this release, and I don’t know what having a job writing will do as far as my desire to write recreationally. We’ll just have to see. Lately on my bus rides I’ve enjoyed reading Wonder Woman comics on Hoopla or library books on my phone Kindle app. But I’ve had this blog so long, it’s not going away. I’ll just update more or less. We shall simply see what the future holds. As always.